Photos from the Berkeley CyberSalon. One year ago today: "Danny O'Brien, writing on an O'Reilly site rants at and about me, and my position on Google's AutoLink. He quotes me saying things I'm quite sure I never said, and don't agree with, and then proceeds to make fun of me for saying these things that I didn't say, and he discredits the ideas behind the quotes, and not surprisingly he wins the argument -- that he's having with himself!" "The irony is that the debate is about Google changing what people say." Phil Jones continues to impress. In the comments on Hugh MacLeod's blog post about me turning down god because I was too busy with RSS, he says: "Dave didn't invent RSS. Nor does he claim to. Go listen to the NerdTV interview he did with Robert Cringely where he explicitly says he realized that (to paraphrase) the second mover 'makes' the standard, and so he threw away his own syndication format to support Netscape's RSS." That's true -- and an important consideration that most people don't seem to understand. In the world of standards the second-mover is the decision-maker, the first-mover is at the second guy's mercy. In the case of simple syndication formats, Netscape was the second mover, they blew off my earlier work. So I decided that I could either sulk about it, or do the powerful thing. Of course I did the powerful thing. I added all the features of their format to mine, which they responded to (as I thought they would) by adding all the features of my format to theirs. At that point, I had what I wanted, I put a bullet in the head of my format, and made RSS my cause. I watched Shane last night, rented from Netflix. 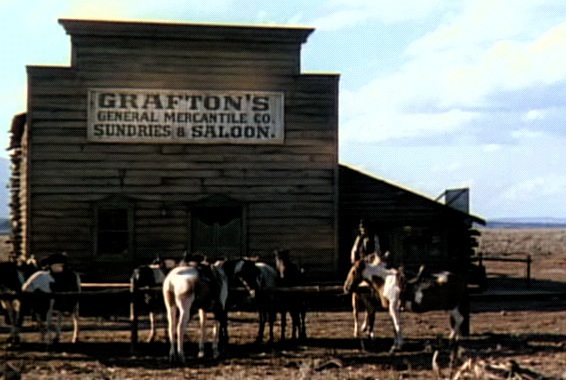 It's really dated, kind of hard to watch because the acting is so bad, and the mid-20th century actors look so out of place in 19th-century Wyoming. But it was worth watching to understand what Nick Carr was saying about the place the blogosphere might be at. Shane isn't shallow like many westerns, it's a faceoff between the old, the ranchers, who tamed a rugged and beautiful valley after the trappers fought off the Indians and laid traps for the beaver. The ranchers feel like the valley is theirs because they paid for it, many of them with their lives, and those that survived, with their youth. Along come the homesteaders, starting their pig farms and planting crops, fencing off the the pastures, and routing water to irrigate their fields so sometimes the rivers actually stop flowing. This is not fiction, this actually happened, the competing uses of land and water, and the argument about what god intended, continues to this day in the mountain west. Shane, played by Alan Ladd, is a gunslinger for the farmers. 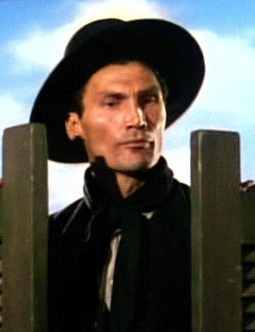 The movie builds to a showdown with the hired gunslinger for the ranchers, played by a young Jack Palance. Ladd wins (of course, I'm giving nothing away) and the farmers take over, for now. But when you drive around in this part of the country today you don't see many farms, the land is too poor for farming and the summers too short. I think the ranchers eventually did win the argument, which kind of undermines the plot of Shane and the story that Nick Carr told. After writing this, I re-read Carr's piece, and it's funnier than ever. Carr is a great writer and thinker. I hope to meet him some day and shake his hand. The question of whether my retirement has any significance for the blogosphere is likely to come up tonight at the well-timed CyberSalon, with a variety of different panelists with a variety of views of the staying power and utility of the blogosphere. Me, I'm tired, and I don't enjoy being the the go-to guy for snarky folk who try to improve their page-rank by leading idiotic tirades about their supposed insights into my character. I want to enjoy the ability to plan and think before my would-be competitors have a chance to position themselves to grab the fruits of my labor. Too much transparency can be a hindrance, so I'm looking for less of that, and more fun, and more options. Me, I'm thinking fiction might be fun. I'm thinking about dialog, and how a novel is a continuum, and a bunch of short stories hanging off a tree, and a few diversions to keep the reader on his or her toes. I'm thinking about the craft of writing in ways I've never done before. I also see that much of what happens in the tech and publishing world happens "off-blog." This week I had a bunch of meetings, in San Diego, Berkeley and San Francisco, none of which were blogged, by myself or the people I was meeting with. Did they care about the looney tunes world that the tech blogosphere has become? Not one bit. At the two conferences I've participated in recently, Under the Radar and PC Forum, after a long absence from tech conferences (Gnomedex last summer was the previous one, and that was an exceptional event for me) that absence does make the heart grow fonder. So by taking a hike and working on my health and learning some new crafts, and working offstage more and more, I hope to evoke more fondness, smiles and hugs, and less lies, sneers and dishonesty. If we've learned anything about humanity, is that it's really good at closing ranks, filling gaps, and moving on. If a famous reporter were to retire, some young dude would come along and take his place, maybe three or four. In the competitive landscape that comes after a big tree falls, comes fresh thinking, as I hope to bring fresh perspectives to my next pursuits. And freshness is good. For me, writing here is becoming stale, I'm energized by the idea of new frontiers, new holes to dig and then fill in and dig again. Last update: Sunday, March 19, 2006 at 10:15 PM Eastern.